Learn how to build your own hanging day bed swing! Ahh, a very relaxing hanging daybed! Is there anybody who doesn’t want to have this piece of furniture in their outdoor area? Building a hanging daybed isn’t exactly a quick weekend project! But anybody who’s simply willing to squeeze in a couple of hours every day can make their own hanging daybed swing in a week! This DIY project doesn’t require any special tools or skills. However, if you are thinking of taking on this project we recommend you consult a professional builder or carpenter (unless you already are one 😉 ) to assess your ceiling joists first. It’s a necessary step to ensure that everything is strong enough to carry the weight of both the daybed and its occupants! 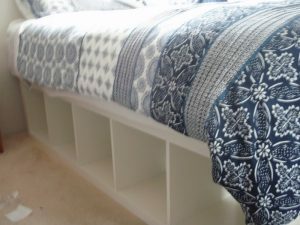 As long as you’ve sought advice from a professional and have taken your time in building a strong and sturdy daybed frame, you’ll be able to enjoy many relaxing and super-comfortable hours in your DIY hanging daybed swing. Be inspired by taking a look at our album of hanging daybed swings below, and learn how to build one by heading over to the step-by-step tutorial by Jordan Valley Home and Garden Club. Previous PostCoffee table and Lego storage in one! Next PostBuild an Efficient A-Frame Hydroponic System! 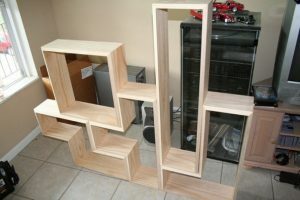 Learn how to build a Tetris bookshelf! We love your page. You give us so many ideas to try at our own home. There are some amazing ideas on this site!!! Vraiment des supers idées!!! Merci et continuez…. Love this site…thank you for all the great ideas! Really looking forward to reading more of your blogs. Love your posts, ideas, and pix! Keep sharing! Love your blog posts, so funny and yet scarily accurate.